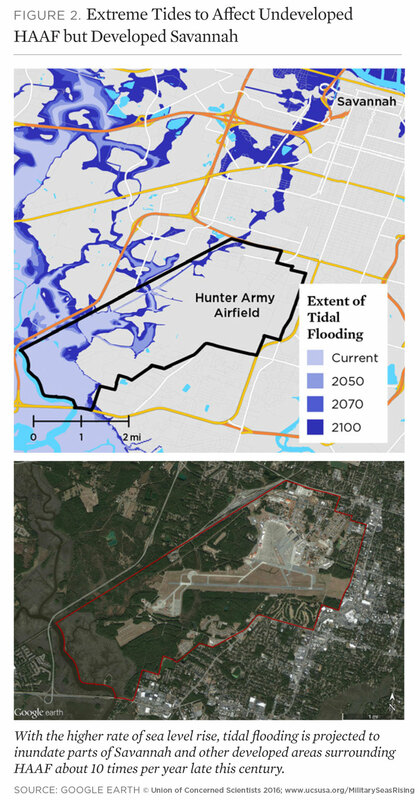 Sea level rise is projected to expose Hunter Army Airfield to deeper, more severe flooding when major storms strike. Seas are projected to rise between 4 and 6.4 feet by the end of this century in the area around Hunter Army Airfield. During the second half of the century, in the absence of preventive measures, HAAF and its surrounding communities can expect more frequent and extensive tidal flooding, loss of currently utilized land, and substantial increases in the extent and severity of storm-driven flooding. Hunter Army Airfield provides training, administrative, and logistical support to soldiers stationed at nearby Fort Stewart, the largest Army installation on the East Coast. Hunter Army Airfield is located in a low-lying area of Chatham County, Georgia, about 10 miles south of Savannah. Roughly one-third of the installation consists of wetlands. The 5,496-acre installation provides training, administrative, and logistical support to soldiers stationed at nearby Fort Stewart, the largest Army installation on the East Coast. The airfield is home to the Army’s longest East Coast runway (over 11,000 feet) as well as Coast Guard Air Station Savannah, which provides search and rescue coverage of the region. The base's exposure to coastal flooding is projected for the years 2050, 2070, and 2100 based on the National Climate Assessment’s midrange or “intermediate-high” sea level rise scenario (referred to here as “intermediate”) and a “highest” scenario based on a more rapid rate of increase. Tidal flooding, land loss, and storm surge from hurricanes were all modeled. In this analysis, land inundated by at least one high tide each day is considered a loss. This is a conservative metric: in reality, far less frequent flooding would likely lead to land being considered unusable. The results below outline potential future flooding scenarios for HAAF, assuming no new measures are taken to prevent or reduce flooding. 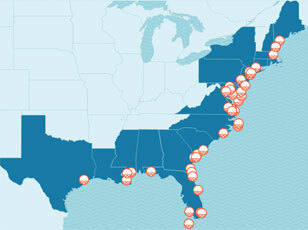 Areas currently affected by occasional tidal flooding could flood with each high tide. Today, low-lying, floodprone areas around HAAF experience tidal flooding about 10 times per year. In the intermediate scenario, these areas would experience tidal flooding more than 150 times per year on average by 2050; in the highest scenario, tidal flooding would occur nearly daily by that date. In the highest scenario, flood-prone locations flood twice daily on average and are underwater roughly 30 percent of the time by 2070. Flooding during extreme high tides will become more extensive. Later this century, the nearby towns of Savannah and Georgetown could experience tidal floods far more extensive than those experienced today. Such flooding could affect transportation routes and other infrastructure important to HAAF. Sea level rise threatens to permanently inundate certain areas. With such regular flooding, the airfield’s protective wetland areas would be at risk of shifting to open water, depending on the ecosystem’s ability to keep up with rising seas. 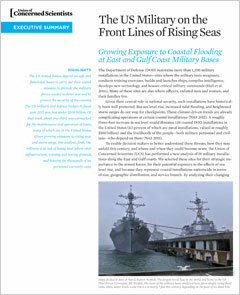 Sea level rise exposes previously unaffected areas of HAAF to storm surge flooding. 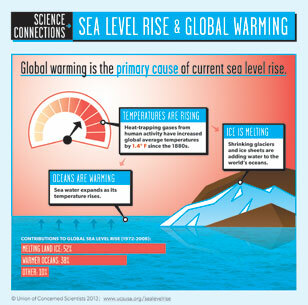 By 2100 in the intermediate scenario, sea level rise increases the area exposed to flooding by a Category 1 storm from 25 percent to over 30 percent; it increases to almost 45 percent in the highest scenario. Sea level rise exposes HAAF to deeper, more severe flooding. In an end-of-century worst-case scenario, three-quarters of the airfield is exposed to storm surge flooding, and more than half of that flooding is 10 feet or more deep. The gap between the military’s current preparedness for sea level rise and the threats outlined here is large and growing. In order to plan effectively for the long term, military decision makers with authority over HAAF need to understand how sea level rise may permanently alter the landscape of this coastal installation and where the threat of storm surge may become intolerable. To take action, however, individual installations like HAAF will need more detailed analysis and resources to implement solutions. Congress and the Department of Defense should, for example, support the development and distribution of high-resolution hurricane and coastal flooding models; adequately fund data monitoring systems such as our nation’s tide gauge network; allocate human, financial, and data resources to detailed mapping and planning efforts at military installations; and, as adaptive measures are identified, allocate resources for these projects, many of which will stretch over decades. Our defense leadership has a special responsibility to protect the sites that hundreds of thousands of Americans depend on for their livelihoods and millions depend on for national security. Extreme tides in October 2015 drove flooding of Highway 80, about 15 miles from Hunter Army Airfield. Tidal flooding in the region is projected to increase this century and to affect not just current flooding hot spots like this route, but also significant areas of neighboring cities such as Savannah and Georgetown. This analysis modeled exposure to coastal flooding for four different points in time (2012, 2050, 2070, and 2100) and two different sea level rise scenarios. For each time horizon and scenario, we analyzed storm surge from Category 1 through 5 hurricanes, the extent and frequency of flooding from extra-high tides, and inundation from ordinary high tides. Detailed maps for each scenario at HAAF are available via Dropbox. For more, please see the methodology used for this analysis.